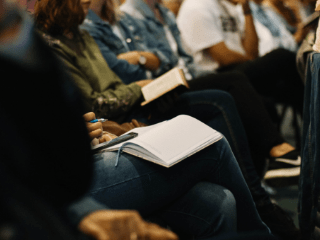 Does year-round RCIA mean year-round sessions? Is your RCIA open all year-round? Does this mean year-round catechetical sessions? When your seekers look at the church, what do they see? I wonder if they see a pyramid — with the bishops and priests at the top, supported from below by the laity. Honestly, that’s the way I saw the church throughout my childhood and most of my teen years. It is the way the structure of the church was taught before the Second Vatican Council. The role of the laity was to help the clergy in their vocation. Vatican II turned that notion upside down. Instead of being a part of the church that assists the clergy, the baptized faithful are the church. All the ministries of the church derive from baptism. Those in specialized roles, such as the clergy, are supposed to serve the common priesthood, that is, the priesthood of the baptized. In another article, I talked about the fear that some seekers have when they find us and how we sometimes mistake that fear for sullenness. Our inability to recognize the fear in the hearts of the seekers inhibits our mission to accompany them on their journey of faith. Why is so hard for us to recognize the fear some of our seekers feel? Why do we assume they are reluctant and uncooperative when they don’t speak up or their participation is spotty? 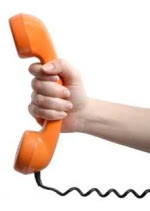 One simple answer is that it lets us off the hook. The seekers who show up regularly and are eager to contribute easy to deal with. They make us feel successful. The "difficult" seekers are a challenge. If we can assign fault to them for not participating enough or not engaging enough, we can let ourselves off the hook. It’s not my fault if Jenny doesn’t come to Mass or come to faith formation sessions. I forwarded the invitation to view the "Build a Powerful RCIA Process" webinar to my colleagues. I've seen quite a few offerings from TeamRCIA over the years and have learned a lot about various RCIA teaching techniques and insights. Even though we're aren't doing RCIA specifically in our Returning Catholics sessions, there is a great deal of overlap that I've found to be useful. We all know that a one-size-fits-all approach to catechumenate formation doesn’t work. But until now, many of us were stumped trying to find a viable alternative. 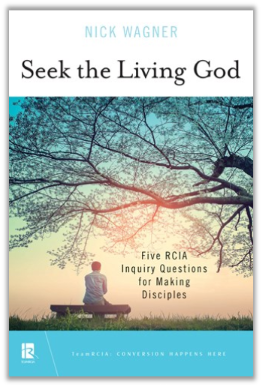 Seek the Living God: Five RCIA Inquiry Questions for Making Disciples is the answer to your prayers. After just a few meetings with your seekers, you will be able to easily create a customized faith formation plan that is tailored to the unique needs of each person. And the best part is that the seekers do most of the work in developing their own plan. Your role shifts from being the Catholic "expert" to being a mentor and coach. Nick Wagner walks you through a scientifically-proven process based on adult learning principles to develop an individualized faith-formation plan for every one of your RCIA seekers. The process is based on a series of five key questions that we ask of every inquirer. And once you understand how the five-question process works, you can easily train others to use it. New team members don’t have to worry about "knowing enough" to be on the team. They just have to be able to ask five questions. This book is a game-changer. Now you can start your RCIA seekers on a path to lifelong discipleship by listening deeply to their true needs. You can be confident that you are leading your seekers through a fruitful, conversion-centered inquiry process that will set them on a clear path to living and praying as committed Catholics. You will be amazed at the powerful conversion that will happen with your inquirers — and with you.